Antitrust commissioner Margrethe Vestager said that she is in favour of country-by-country reporting for multinationals to avoid dodgy tax practices. EXCLUSIVE / Margrethe Vestager, the EU’s powerful competition commissioner, believes “everyone should thank the whistleblowers and investigative journalists” who uncovered the so-called ‘Luxleaks’ scandal and says she is “personally in favour” of country-by-country reporting on corporate taxation. 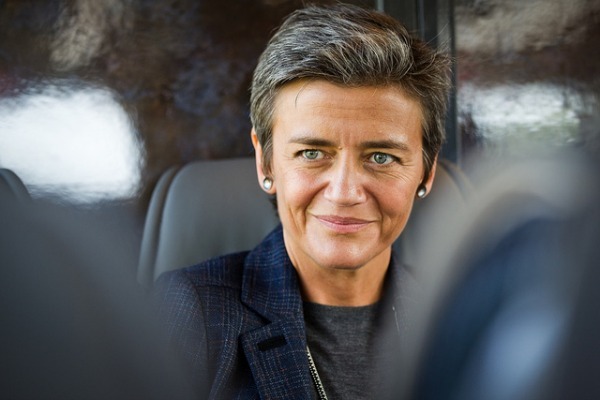 In an exclusive interview with EURACTIV, Vestager also speaks about ongoing cases involving Apple and Google, as well as Gazprom and Greece on the energy side. Margrethe Vestager is the Competition Commissioner. Before that, she served as Denmark’s Minister of Economy and Interior . Vestager spoke to EURACTIV’s Jorge Valero. The new rules for banking resolution in Europe entered into force on 1 January. Just before that, there was some controversy around cases in Italy and Portugal. Investors were misinformed by Italian banks, while the Portuguese central bank imposed heavy losses in a discriminatory manner on some investors in Novo Banco. Will the new Bank Recovery and Resolution Directive (BRRD) help to avoid this situation, or it is just an instrument to prevent new rescue packages with taxpayers’ money? I think both. It is obviously an instrument to prevent bailouts, and instead to let investors and the banking sector to pay themselves if they get into trouble. That being said, I think it is very important for people to be much more informed about the kind of products they have. One thing is that you as an investor take a risk, as in any kind of business, but you should know that you are an investor. Therefore, the BRRD should initiate a change in how banks inform their customers, and how you as a customer ask questions. If you want a savings product, this is what you get, because looking backward, some of the very sad cases have been exactly about this. People who were absolutely sure that they have established a savings account in reality were investing in the bank. Should there be additional rules to avoid situations like this, or just more scrutiny of how banks inform their customers? You will find in the legislation quite a lot of demands on how to inform the customers. I do not think we need new legislation, but the fact that the BRRD is now in place should trigger a much more dedicated use of the obligation to inform included in other parts of the legislation. In regards to Luxleaks, you are looking into more than 300 tax rulings agreed between member states and multinationals. Can we expect new cases in this quarter? Actually I don’t know yet. What I know from the 300 cases is that we found examples where everything is by the book. But so far, we have not gone through all the 300 cases. Obviously, if we find something that concerns us, we will open more cases. Is there any case that could sound the alarm bell right now? Not on my table. They may have two different piles in DG Competition, but they have not reached me yet. One of the most important open cases is the tax agreement between Apple and Ireland. The Irish government said that the decision will come after the elections. Is that right? There has never been a timing for the case. So if there is no timing, there cannot be a postponement. Is it expected by the end of April? A lot of people have interest in the timing. But I think there is a lot of guesswork as to when the Commission makes a decision in the very last phases of a case. Sometimes something looks very straightforward, it seems well on track, and then something happens. Companies give you a lot of new material that you would need to assess, or sometimes you ask more questions, and that completely changes the pace of the case. In Ireland, the election has to be called. So we cannot tie our decision when it comes to that. For me, the decision is to be taken when the work case is done. And I need to be very certain, because there is an obvious probability that the decision would be appealed, so the case would end up in court. I would be very surprised if the court pays any attention to political timing. On the contrary, they would find that it is something to be criticised. The Luxleaks scandal was unveiled by a whistleblower, who may face jail time. What are your feelings about this? It is very difficult for me to say anything about it, because I cannot do anything about it. Every member state has a different set of rules. But of course Luxleaks could not have happened if it was not for the whistleblower, and the team of investigative journalists. The two worked very well together to change the momentum of the debate about corporate taxation in Europe. I think everyone should thank both the whistleblower and the investigative journalists who put a lot of work into this. My problem is that I cannot do anything to prevent it. Since state aid cases take such a long of time, what else should be done from the legislative side to avoid dodgy tax practices in the future? Are you in favour of country-by-country reporting? Yes, I am personally in favour of it. We have had a public consultation, which has given mixed results. Because there is also a downside as regards to country-by-country reporting if it is done in a very complicated way, or you also want to ask small businesses. You should find a way to do it. But I think that it is very difficult for tax authorities, for journalists and for citizens to relate to corporate transaction if there is no transparency. I share the expectation with a lot of European citizens that not only some companies pay their corporate taxes, but every company pays their corporate tax. Over the last almost 10 years, many citizens have seen how governments have done a lot of things to control their budgets by increasing income taxes or the VAT, or by lowering the salaries of public employees. That may have been justified, but then you would expect that corporate taxpayers also contribute when they make their benefits in the country. Google is one of the clearest examples of the growing power of online platforms. Is more regulation needed to limit their power, or are the existing norms enough? I look very much forward to the results of the public consultation we launched in September, in order to understand the concept better. When we speak about online platforms, I see they share the name, but I don’t see they necessarily share the characteristics. While we do that, it is important we keep pursuing with antitrust rules if a platform is misusing its position. Even if new legislation is needed, it would take a long time before it is fully implemented. Should we exclude an agreement with Google after the rather negative response they submitted in autumn? One should be very careful to exclude anything. So far we are on the formal procedure, analysing the responses to the statement of objections. It takes a lot of work, as it is a very substantial answer. In the case of Gazprom, the company is flexing its muscles once again in Bulgaria. Overgas sent you a letter before the Chrismas break warning that Gazprom would cut gas supplies by 1 January. Do you see this as a new demonstration of abusing its dominant position? Does it concern you? It is hard not to be concerned if people cannot heat their houses. So this case concerns us. Nevertheless, the Gazprom case has a different dynamic compared to the Google case. In the case of Gazprom, we have a two-tier track. We have the formal procedure: they have replied to the statement of objections, and they have their oral hearing before Christmas. At the same time, we are discussing commitments both at the technical level, but also at my level. It is not all there yet, but it is moving forward, as well as the formal procedure. In light of the progress made on the more political level, do you think that an agreement could be reached with Gazprom? I don’t see it as political talks. It is very important to underline this is a competition case, no matter what kind of company you are. You can be a state-owned or privately held company, (but) if you want to be in the European market, you should follow the European rules. This is not about politics. The Commission feels the obligation to pursue this no matter what the company is. If you ever put politics into that pot, it would be difficult in the future, because everyone would look into the politics, and our obligation is to prove our case. That is the reason why we have a two-tier approach (with Gazprom), because we have to do our work. In a recent interview, you were concerned about the monopoly situation in the Greek energy market. Will it improve after the latest reforms? It is very early to say. As you said, things are moving forward. Everything is in the implementation phase. Therefore, it is very early two say where we will be in two years’ time or five years’ time. Some of these markets also develop very slowly, because liberalisation has taken place very recently, and the implementation of the Third Energy Package has been also very recent. It is very important to pursue the reform track, but not to make final judgments before you see stable results. Should the creditors pay closer attention to the energy market as one of the priority areas? It is not only for the Troika, but for the Greek government to pay very close attention to it. It is in the interest of the energy supply, affordable prices, or when it comes to climate. It is in the interest of the citizens. There will be a legal procedure for Mr Deltour actually because of leaking sensible documents outside the company .